If you’re here, you must be wondering, who is Ruth Louden? In my work as an Education and Employment Coach, I ask clients all kinds of personal questions to get to know them. So it’s only fair I share my own career story with you, including some of the challenges I encountered along the way. Early days: good at getting lots of jobs, just not the right ones! Between the ages of 12 and 25, I had worked in so many jobs, it was hard to count. How many? I dunno – maybe 20 or so. Let’s see, baby sitter, paper girl, cook, cashier, waitress, bartender. I was also a flatwork operator in Banff, English teacher, sales clerk, fitness leader, telemarketing rep, receptionist, and secretary. I knew how to get a job. But really, fundamentally, I didn‘t know much about getting a great job and less still about managing my career. Secretly, each time I thought about going after a plum job, I wondered: why would anyone want to hire me? 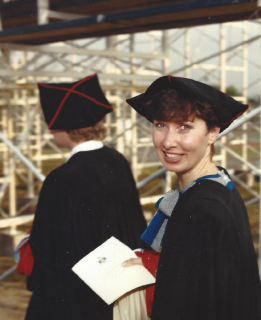 Ruth Louden graduates from York University. 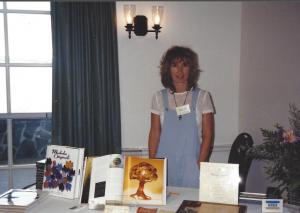 A Master’s student at the time, I was in need of a summer job between year 1 and 2 of my program. A classmate sitting next to me, filing her nails while we waited for the prof to arrive, gave me the lead. Classic networking! At 29 years old, I landed what I considered to be: My First Real Job. Reporting to the owner of a small Toronto executive search boutique, I wrote proposals and created job advertisements. I developed a computerized database that stored contact details on all the people out there looking for work. And I discovered what it felt like to know my opinions, experience and skills mattered. Pretty darn good. How the topic of money could be like Goldilocks’ three beds – negotiating too hard or too soft were both a bit of a turn-off to the recruiter. 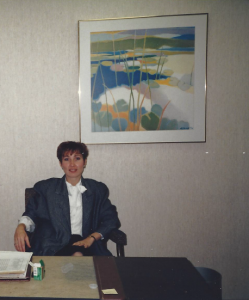 Ruth Louden in her first real job – in her own office!!! Oh my, we look so serious, don’t we? But oh how we laughed! A couple years later, I had learned just enough to negotiate my way from a small boutique to a major professional services firm. At the time it was Touche Ross Management Consultants, known today as Deloitte. As a Human Resources Consultant, specializing in Executive Recruitment, I was the middle person between the hiring manager and the candidate. Over the telephone, I wooed candidates from their existing place of employment to contemplate a new career destination. Through the lens of my client, the hiring manager, I evaluated thousands of candidates in face-to-face interviews. I would spend my days hearing career stories of ups and downs, twists and turns, fortune and misfortune. Behind the scenes, I guided hiring managers in making their hiring decisions. Like talent scouts, we presented only “the best and the brightest” to make sure new hires provided a hefty “return on hiring investment”. Like auditors we encouraged them to “manage risks of a bad hiring decision”. I was well paid and working with one of the top management consulting firms in Canada. I had great colleagues who made me laugh to the point my stomach hurt. But was I happy? There came a time when I sat down to think about what I really wanted to do in my career. I took a 9-month time-out to travel and think about what was important to me. I discovered that my more rewarding moments came when helping those who didn’t get the job do better the next time! Executive search is fundamentally about solving business problems, requiring a business person’s eye on the bottom line and persuasive gift of the gab. Deep down, I felt more like a social worker than a business person, with a counsellor’s lens, appetite for listening and language of empowerment. Coaching managers and mid-career professionals who did not get the job be more effective the next time. I am happily engaged in this work today, at the University of Toronto’s Scarborough. My 17 years at the U of T have confirmed for me how tremendously satisfying is my role working alongside individuals at career crossroads. 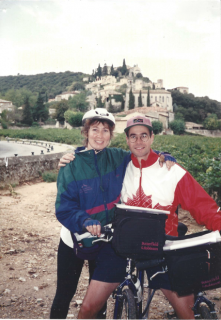 My career journey has had many twists and turns, but some of the themes have stayed pretty constant. Since the ’80s, I’ve been what I like to call a “motivational listener”. 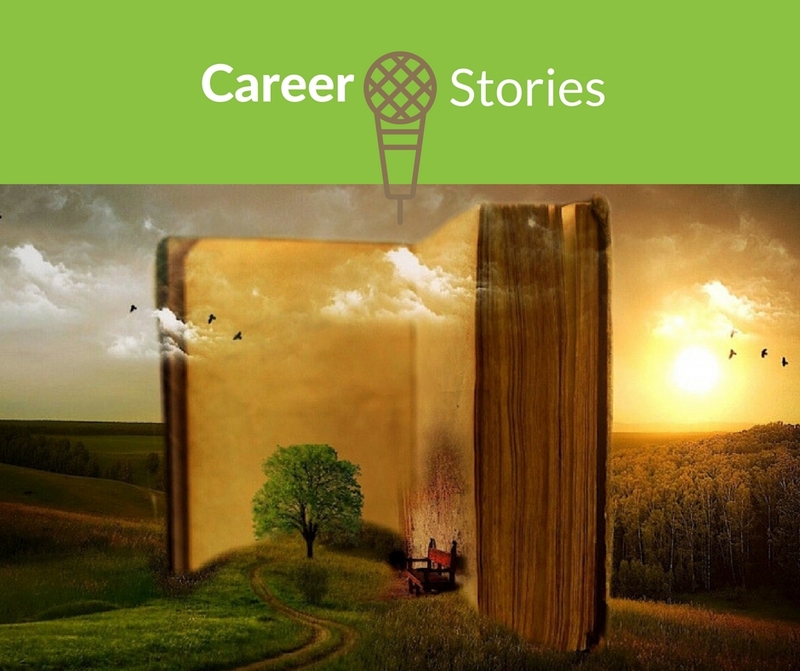 I’m fascinated by other people’s career stories. Clients tell me I bring helpful perspective to them, along with a caring attitude and sense of humour. My specialties are preparing candidates for the realities of a competitive application process, be it for competitive university programs or navigating the job market. As a recruiter and co-op manager, I’ve been inside organizations large and small, across dozens of industry sectors and into the day-to-day realities of hundreds of occupations. Being a manager for many years reinforced the importance of hiring the right person for the job. This same person has the ability to bring you joy during your workday or prevent you from sleeping at night. 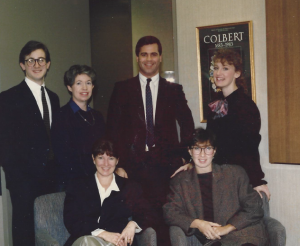 Experience on the admin team at McKinsey & Company in the ’80s and later on the management consulting team with Deloitte for 7 years instilled in me a love for creating strong communications. And years of education, training and business development roles have taught me a thing or two about the art and science of presentation. 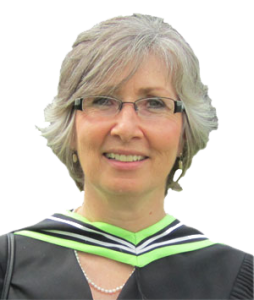 Ruth Louden returns to her studies…again! Finally, I consider myself to be an educator and advocate for life-long learning. With two Masters degrees behind me, I am a firm believer that education can open doors to a better future. I enjoy the challenge of helping clients navigate a complex and competitive educational market and pursue their education goals with confidence. Making change in our lives is stressful. Outcomes of our career decisions and actions are not entirely in our hands. As a coach, I think it’s important that clients cultivate wellness and resilience. These life ingredients sharpen your vision and strengthen your resolve to make change for the better in your life. They also help you bounce back from inevitable disappointment. In the last 4 years, I’ve had the privilege of teaming with colleagues at UTSC to develop a program called Flourish. This wellness initiative helps university students build confidence in their strengths and resilience to persist in their studies. I think our resources can help you too! Mostly, my learning has taught me that it doesn’t matter what I know. More important is what my clients know, feel, believe and do in order to get to a more ideal working place and healthy emotional space. I work alongside my clients, focusing on your working identity matters. In turn, I help you develop skills and confidence to flourish in your studies, on the job and throughout your career. For specific details about my background and qualifications, please visit my LinkedIn profile.